I had such a utopian vision of what our days were going to look like. J-Man would wake up around 8:00 AM happy and excited to start the day. We would talk about our plan for the day in a morning meeting as we ate the home cooked breakfast that I made. We would get set up for the day and then do a little yoga, finally settling in to whatever J-Man and I planned to focus on for the day. When he was working independently, I would do laundry, dishes, and stop treating my house like a victim of neglect. It took one day for me to see that this was not going to work. First, I grossly underestimated how long the activities we planned would take. The cool thing about working with J-Man is that I get to spend time with him and see what he enjoys. I get to learn more about his strengths and areas where he needs more help. 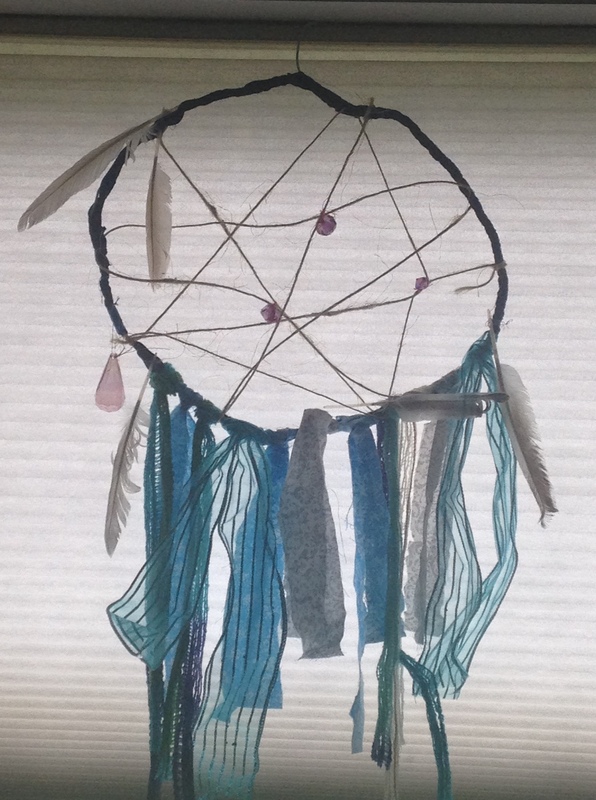 We spent hours on a dream catcher that turned out beautifully, and in the process I found out he has had nightmares lately that he hadn’t told me about before, but these conversations took time. So, more than an hour past when I imagined we would be done. So, then we started reading together and I was doing the whole, “Oh! No! What will happen to Sophie?” (because I haven’t read the whole thing yet). I was thinking we would have this great conversation about predictions and evidence in reading, and he said, “It’s OK Mom. I know she’s OK. I finished already.” He was reading to humor me, but also because he wanted to snuggle up and share something he enjoyed. The take away is this: We won’t get to everything I would like us to do in a day. Some days, we might not to get to any of them because we may have an urgent need to get to the beach, but what we are getting is closer everyday. My house is still a mess, I am four days behind on the blog, and I am behind on my work for my etsy shop, but I wouldn’t change a thing. Are you making it all happen? Share your tips for organizing your days! Please!